The Flambeau South Beach 1 light ceiling pendant in textured cream and black finish features New Orleans style and flamboyant design. Domed circular mount and slender drop rod in hand-painted cream and black stripes, with sphere and leaf lower finial in gold leaf. An inverted tapered 15″ shade sits on top, hand-painted in textured cream and black stripes. Balmy breezes, white sands and palms trees swaying in the ocean breeze all inspired designer Paul Gruer’s South Beach family. 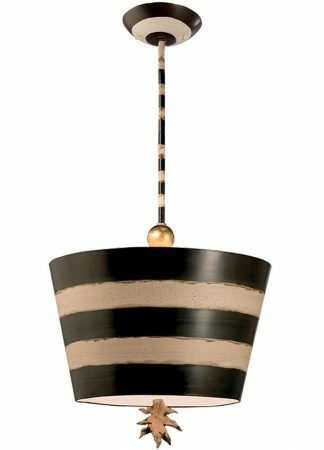 Hand-painted black and cream stripes outline the shade, with gold palm leaf finials and the rod is topped with a matching shade and gold leaf orb. 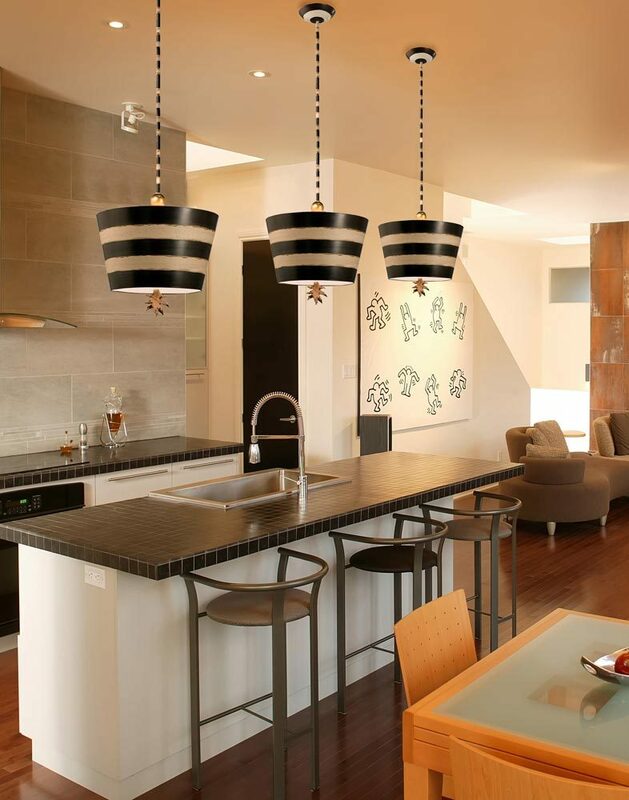 This New Orleans style pendant light looks fantastic in any room and is particularly suited to a stylish dining room, kitchen or installed over a breakfast bar, seating area or worktop. The classy design is sure to be a conversation starter and works for so many interior styles and makes any room as individual as you are. Supplied with two 30cm and two 15cm rods that can be used in any combination to achieve the desired drop, please see the technical information below for dimensions. There are matching fittings in the South Beach collection that includes 1 light table and floor lamps, please see below. Supplied by Elstead Lighting and designed by Flambeau in New Orleans who offer unique and distinctive lighting collections. Working with specialist designers who model up their own original creations using distressed finishes of gold and silver leaf to create 21st century antiques like the South Beach 1 light ceiling pendant in textured cream and black finish you see here.